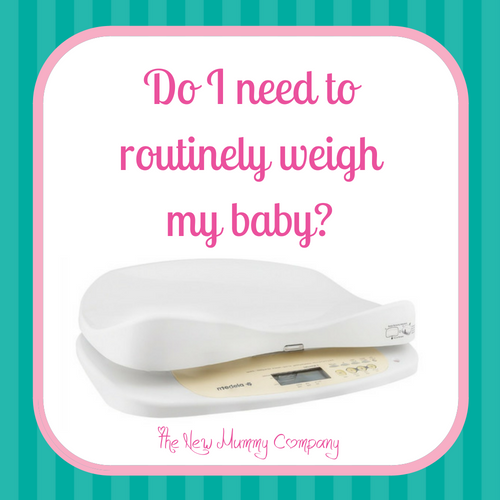 Do I need to routinely weigh my baby? | The New Mummy Company Inc. Weight is one of the many tools used to measure your baby’s growth and development. Beginning in the womb, your baby is commonly measured by either your doctor, midwife or nurse. Your baby’s size can be estimated in the womb by measuring the length of your bump with a measuring tape (called fundal height measurement) or by using an ultrasound to measure your little one. After you give birth, your baby is usually weighed within a couple of hours to measure their birth weight. If you are attending a health professional for care after birth, your baby is routinely weighed on day 5 and 10 of life, continuing routinely in the first 6 weeks of life. If there has been or is significant weight loss after birth. If there are feeding challenges such as poor latch on the breast, low breast milk supply, trouble with swallowing milk from both breast and/or bottle. For babies with additional feeding needs such as SNS or tube feeding, cleft lip or pallet, slow to feed, etc. For babies with chronic health conditions that effect their development or weight gain. For breastfeeding mothers that have had breast surgery and wish to measure their baby’s breastmilk intake accurately. If your baby is on feeding plans that require supplement milk in addition to nursing. How does weighing my baby with a scale measure my baby’s milk intake? The electronic weighing scales takes a measurement of your baby’s weight just before and just after breastfeeding. The difference between these two weights equals the amount of breastmilk intake your baby drank in the breastfeeding session. If your baby nurses again in quick succession after the post-feed weight, there is an option to reweigh your baby to add in the intake in the second feed to the overall total. Does any weighing scale work or do I need a professional weighing scale? When you have been advised to measure you baby’s milk intake, it is best to use one that will accurately measure your baby’s weight and milk intake. The Medela BabyWeigh II scale is one of the most commonly used hospital-grade weigh scales used across Canada to measure baby’s weight and milk intake while in hospital or in the doctor’s office. Lactation consultants also frequently use the Medela BabyWeigh II scale when measuring a baby’s milk intake if the LC requires a weighted feed as part of her assessment of milk transfer. What makes the Medela BabyWeigh II scale unique? The Medela BabyWeigh II scale is used widely across Canada in many NICUs and Special Care Baby Units to monitor babies milk intake and their overall growth. The scale has a memory storage unit that stores your baby’s last weight which is a unique factor – meaning you don’t have to remember to write the weight down before feeding your baby. Why should I rent the BabyWeigh II scale rather than buy a scale? Weighing your newborn is often for a short amount of time in their lives. Renting a BabyWeigh II scale not only gives you accuracy, but you also have the support from The New Mummy Company and Medela in the use and care of your scale. When you are finished with your scale, a return appointment can be arranged to have your scale picked up from your home. – meaning no waste for you to dispose of and your rental can all be arranged from the comfort of your home. All-in-all, do you need to routinely weigh your baby? The answer is entirely dependent on your own situation and your baby’s needs. Your nurse, midwife, doctor or lactation consultant may suggest weighing your baby regularly to monitor your baby’s ability to transfer milk from the breast or purely to monitor your baby’s development. Some families choose to have a baby weigh scale from birth to measure their little one’s progress in the first few weeks after birth – which is a personal choice. If you wish to learn more about our BabyWeigh II scale rental service from The Baby Driver at The New Mummy Company visit our website https://www.newmummycompany.ca/services/medela-babyweigh-ii-scale/ or call us on 1-844-237-4686.